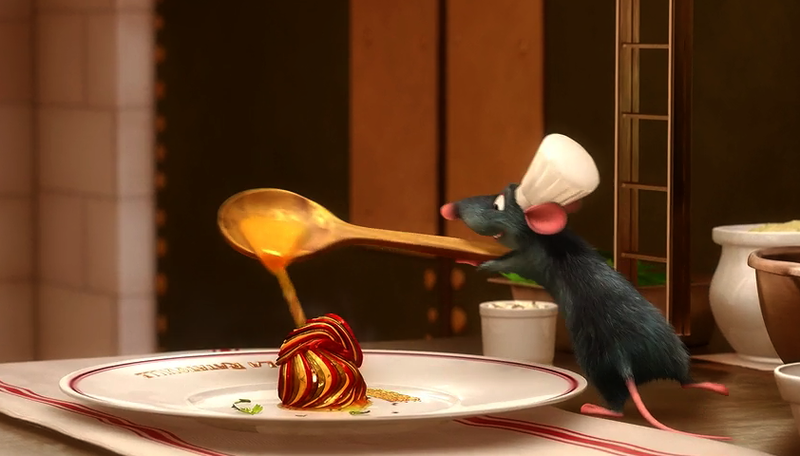 Always wondered how to recreate Remy's ratatouille from the animation movie? Now you can, it's easier than you might think! First of all, this is not really an official ratatouille. 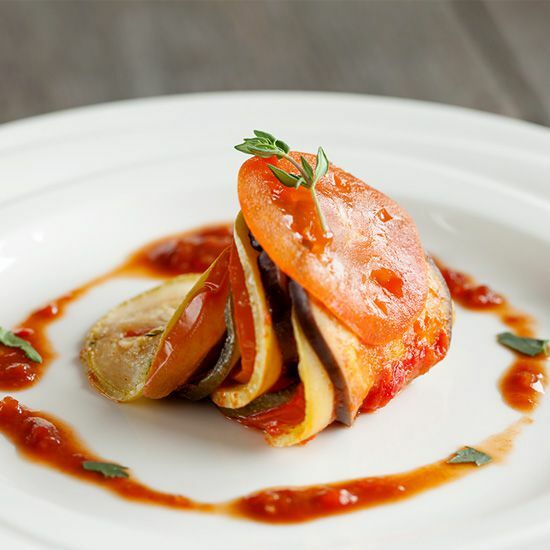 It is the ratatouille Remy made in the animation film, actually this is called confit byaldi. But we thought it would be fun to recreate the dish from the movie. Slice the bell peppers in halves and remove the seeds. Place them cut side down on a baking sheet and drizzle with olive oil, pepper and salt. Place the bell peppers in the oven for about 30 minutes on 230 degrees Celsius or 450 degrees Fahrenheit. When the outer skin starts to brown, remove from the oven and let it cool off a bit. Meanwhile, cut the onion and 3 of the garlic cloves, you gonna blend the sauce eventually so it doesn’t really matter how you cut the onion and garlic. Heat olive oil in a large skillet and sauté the onion and garlic cloves on medium low heat. Be careful they do not brown. Add the canned tomatoes, bay leaves, sprigs parsley and 3 sprigs thyme. Let it simmer on low heat for about 15 minutes. Peel the outer skin from the bell peppers and slice them in smaller pieces. Add the roasted bell peppers to the sauce and let it simmer for another 5 minutes. Remove the bay leaves, parsley and thyme from the sauce. Blend until it’s a smooth sauce and season with salt and pepper. Divide all of the sauce on the bottom of a baking dish. The vegetables slices should be really thin, so it’s best to use a mandoline or maybe a food processor with the right attachment. Slice the eggplant, both types zucchini and the tomatoes. They should all have the same thickness. Finely cut the remaining garlic cloves and strip the thyme leaves from the stem. Add some olive oil and season with pepper and salt. Now you place the veggies on the sauce. Do not leave too much space between them and just keep on layering them in the same order. Divide the garlic and thyme oil over the veggies. Cut a piece of parchment paper in the exact size of the baking dish and place it on top. HEAT the oven again to 140 degrees celsius or 280 degrees fahrenheit. 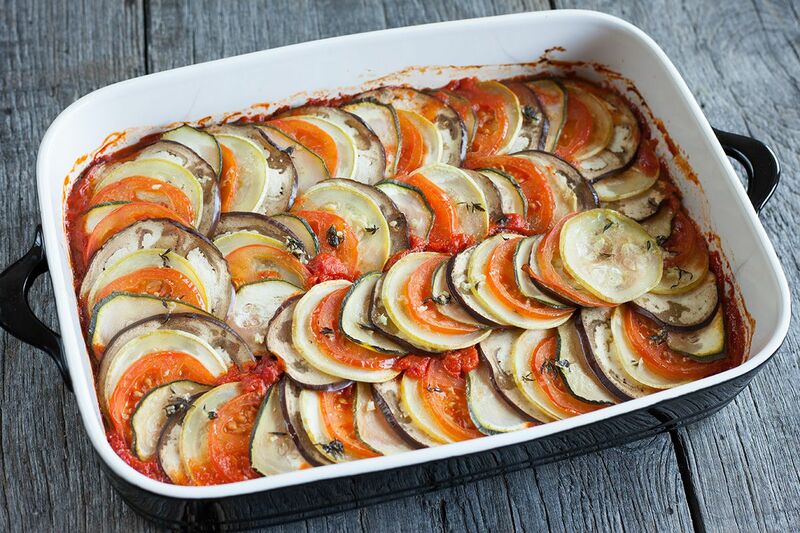 Bake the ratatouille in 1 hour, check if the veggies are softened enough. If you would like some more color, bake it some more without the parchment paper. 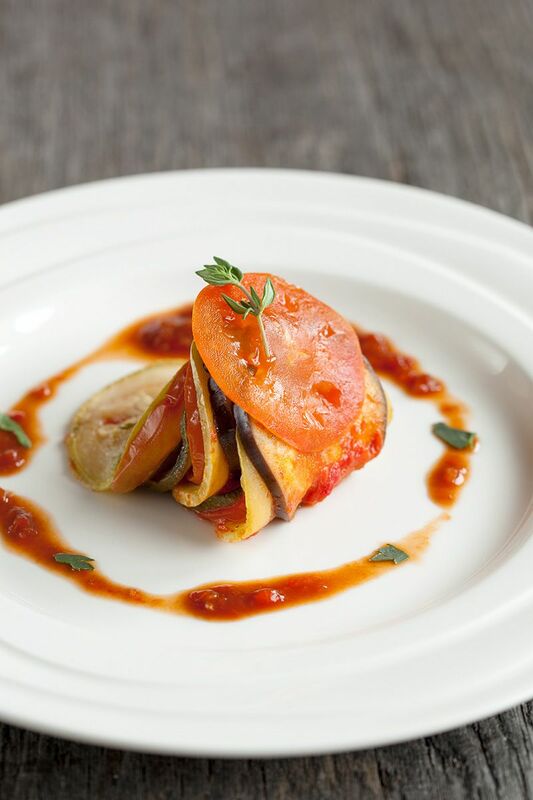 For Remy’s ratatouille presentation, stack them against each other. Add a little balsamic vinegar to the sauce to make it a little darker and less thick. Carefully pour the sauce around and finish it all off with a thyme sprig or some chive. 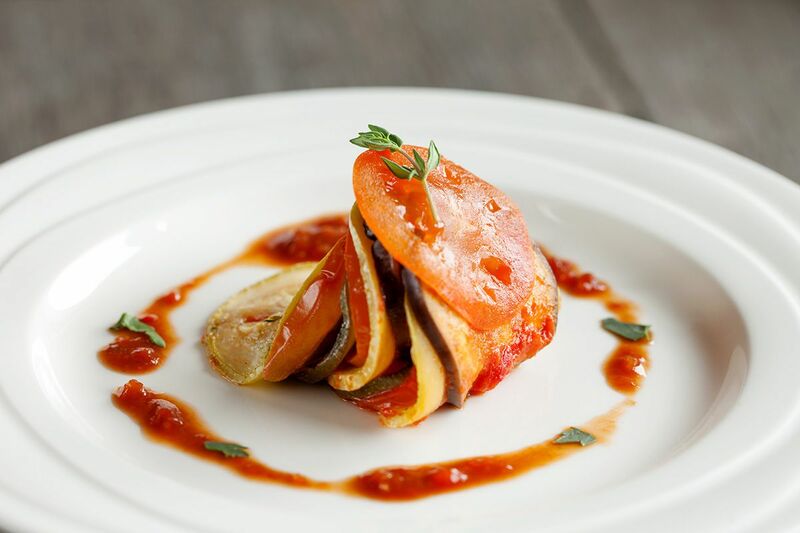 Ratatouille is one of the easiest yet most delicious French dishes. I haven’t made one in a long time and you definitely have inspired me to. Great to hear you are inspired Thalia, enjoy ! I made this dish and was impressed. Wow. It took a long time but when it was done it was an absolute stunner. Thanks for the recipe! Hi Ellis, it sure does take a lot of time, but so worth it ! When it says divide the sauce.. Do you put half of it on the bottom and save the other half for later? Just wanted to clarify. Thanks! Hi Al, sure! We mean divide *all* the sauce over the bottom of the baking dish, we’ve updated the recipe to reflect this. 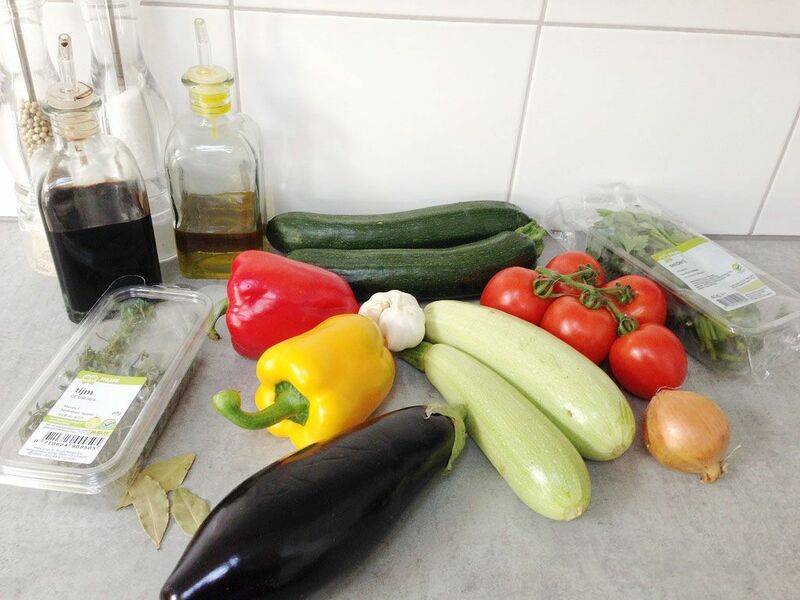 Have fun cooking! Did I miss where the bay leaves go in to the dish?